Several years ago, I thought I’d made it. 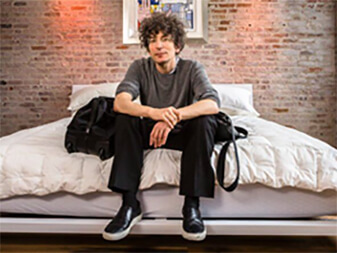 I had made myself a lot of money so I bought the biggest apartment in NYC. I needed a ladder to get to my comic books. I took helicopters to Atlantic City and would gamble for 48 hours straight while drunk. I had never had money before in my life. I had everything I ever thought I wanted. There was a time I was losing a million dollars a week… In just a few months, my bank account went from $15 million to $143. Also I was in the middle of a divorce. I had to sell my apartment. I had nowhere to live, no job, no friends to turn to. I had nothing. I became horribly depressed. Most days, I couldn’t pull myself off the floor. Then I began to realize something: success in today’s world ONLY happens you choose yourself. Choose yourself for happiness. Choose yourself for freedom. Because if you don’t choose yourself, someone else will and the result won’t be pleasant. And when I began to understand that, little by little, I started to pull myself off the floor. 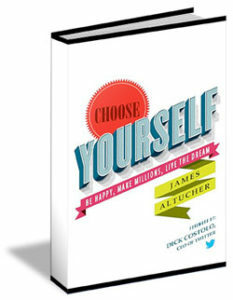 “Choose Yourself” means whatever you want it to mean. For me, it meant freeing myself from corporate jobs and managers who hated me, from houses that kept me stuck in one place, from possessions that created a cage around me. It means creating a safety net for myself in an uncertain future. It means improving myself 1% each day in every area of my life. For you, maybe it means creating time. Or resources. And pursuing your passion. Maybe it means making a name for yourself at a job you enjoy. Maybe it means making more money. And getting unstuck. Or moving away from having just one income stream that might not work out for you. Or maybe it just means getting healthier, mind, body and spirit. Ultimately, it’s about going deeper and exploring what it means to be human and achieve well-being in a world that is increasingly complicated. This is what people struggle with. It’s the layer underneath the bills, the relationships, the sicknesses. All of that are just byproducts of finding well-being in life. You have to unlock your own cage. And give yourself freedom to choose yourself. Being an “entre-ployee” is when you take the entrepreneur mindset and apply it to your current job. Take control of who you report to, what you do, what you create. Anyway, if you are at a job you hate… usually, I say quit. I’ll tell you why… and I write about them all the time. But it all comes down to this: when you work at a corporate desk job, you’re putting your fate into someone else’s hands. If you’re not ready to leave your job (yet), I’ll tell you how to LINK your financial success (or other kinds of success) to the success of the larger company. If you can figure out how to do this, then you can stay at your job forever and watch it grow. At a job you can do something that you can’t do elsewhere. Becoming an idea machine is what happens when you’re about to kill yourself. When life puts a gun to your head, you figure it out or you die. My back was against the wall and my life insurance policy was the gun. I had ruined my life, and thought I was worth more to my kids dead than alive. It was either come up with good ideas for how to rebuild the life I destroyed, or kill myself so my kids could inherit something. Becoming an idea machine saved my life. Ever since I became an idea machine, my life has changed 100% every six months. You become an idea machine by working out your idea muscle. Making it sweat. I do this by writing down 10 ideas a day. They don’t have to be great ideas. In fact, most of them will be terrible. You’ll probably never look at them again. But when you do it enough times, all of a sudden your brain starts getting into the habit of thinking up new ideas, until one day it actually comes up with a good one. And then another. And so on. Physical – Being in shape. Doing some form of exercise. You can’t be happy if you’re sick. Mental – Everyday I write down ideas. I write down so many ideas that it hurts my head to come up with one more. Then I try to write down five more. Some will be good, some will be bad. The “idea muscle” is just like any other muscle—it atrophies within days if you don’t use it. By the way, It took me months of reading about “becoming an idea machine” to actually be convinced. Spiritual – Feeling gratitude every day. I feel that most people don’t like the word “spiritual.” They think it means “God.” Or “religion.” But it doesn’t. I feel like I have a spiritual practice when I do one of the following: pray, meditate, be grateful, forgive, study. Inside every difficult problem, there is the tiny seeds of gratitude that can blossom into happiness in your life. Counting gratitude to three is ok. To ten is better. To 100 is life-changing. Emotional – Be around people you love, who love you. If someone is a drag on me, I cut them out. If someone lifts me up, I bring them closer. I was spending time with people who were bad for me. How do you know if someone is bad for you? And If you say yes to any of the above, then even if they are sitting at the table across from you right this second, stand up and go sit at another table. Trust me. People will quickly show you who they are. I’ve reinvented my career, my interests, my life, many times over the past twenty years. This is the book I wish I had at the beginning of that long and often volatile journey. And now the entire world: technology, governments, the shifting landscapes of opportunity and success, are all turning upside down, forcing us to reinvent as individuals and as a culture. Along my own journey I have read and encountered dozens of other successful leaders, artists, entrepreneurs, and mentors who I have learned the art of reinvention from. The journey has been intense. The obstacles were hard fought. And the adventures that led to me now finally sharing it all in this book has been both painful and exhilarating. 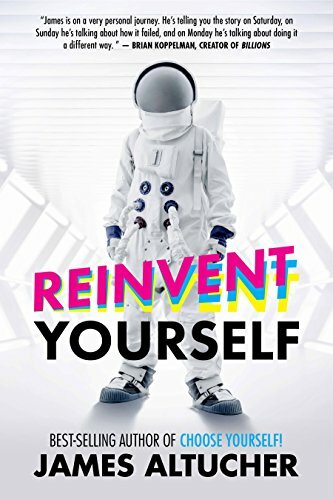 I describe specific techniques, share stories, tell the stories of others, and give the ultimate guide to not only how but why it is critical for people to master the skills of reinvention. What I’ve learned: change is the only constant. Companies decay, technologies disappear, governments change, relationships change and opportunity is a shifting landscape. Reading the stories and learning the critical skills taught in Reinvent Yourself is how I found my own way through the chaos of change and onto the path of new opportunity and success. Again, this is the book I wish I had in my hands twenty years ago although I am glad that I am writing it now. You can get a free copy of Reinvent Yourself here. The world is changing. Markets have crashed. Jobs have disappeared. Industries have been disrupted and are being remade before our eyes. Everything we aspired to for “security,” everything we thought was “safe,” no longer is: College. Employment. Retirement. Government. It’s all crumbling down. In every part of society, the middlemen are being pushed out of the picture. No longer is someone coming to hire you, to invest in your company, to sign you, to pick you. It’s on you to make the most important decision in your life: shoose yourself. Every “fix” from the government makes things worse. The “old world” has been demolished… and people are desperate for answers. This is not a book for the faint of heart. Read at your own risk, because sometimes the truth is hard to take. But for those who are ready to hear, my book provides an updated map of the new territory for generating wealth and freedom. 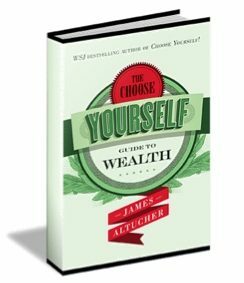 You can get a free copy of Choose Yourself Guide To Wealth here.